Ring out the old year, and ring in the new with some resolutions to benefit your smile. 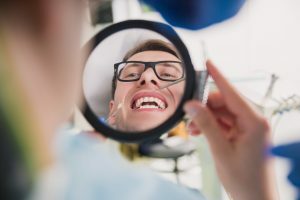 Even with the best brushing and flossing habits, and visits to your Celina, TX dentist on a twice-yearly schedule, you can still find yourself hearing those four little words: “You have a cavity.” The good news is, when cavities are caught early, they can be addressed with a tooth-colored filling, and your life can continue as usual. If you adopt a few dental resolutions, you might be cavity free for many years. We are going to take it as a given that you are using good brushing techniques, and cleaning your teeth twice a day. But we have heard from other patients, flossing is not as simple. It is important to floss daily, to remove food debris and bacteria in places your toothbrush can’t reach. If you are having issues with flossing, ask a member of our dental team for suggestions or a demonstration. How easy it is to delay (or skip entirely) your routine exams and cleanings. When things in your mouth are going well, and life is busy, dental visits for you or family members can slide. Your attention to regular visits will most likely pay dividends in fewer cavities, however, as we can warn you of places you are missing when you brush. At preventive exams, we also clean tarter from your teeth, polish their surfaces to make it harder for bacteria to adhere, and check for signs of bigger issues like teeth grinding or signs of oral cancer. Teeth do not have nerves, which is one reason cavities can go unnoticed when they are forming. If you have unexplained tooth pain, please come in for a visit. If tooth decay has moved towards the center of the tooth, where it can irritate nerves, we have solutions other than fillings, that still may save the tooth, and restore you to comfort. If your tooth might need a filling, we can assess the situation and perform whatever procedure is needed. Get the information and treatment you need in Celina, TX by contacting Celina Family Dentistry to schedule a visit today at (214) 851-0130.